To the casual observer, Andres appears to be an average third-grade boy. In reality, his life has been heavily marked by a number of health problems since he was born. He has undergone several heart surgeries, for which his single mom, Fiorella, took him across the border to Brazil where he was able to benefit from government-subsidized medical care. He was also treated for hydrocephaly as an infant. The hydrocephaly has been resolved, but his heart problems persist. At a check-up in early 2017, doctors told Fiorella that Andres needed another procedure to fix his heart’s atrial wall muscle. Fiorella and Andres live with Fiorella’s two younger brothers in Santa Cruz, Bolivia. All four are supported by Andres’s grandfather, who has a dairy farm in the town of Guarayos. Fiorella’s brothers are full-time university students, and she sells clothes to supplement her father’s financial support. Fiorella was juggling a lot of worries while she looked for the best option to treat her son’s latest need, and for support to cover the cost, which was well beyond even her yearly income. Thanks to Dharma Social Projects and a network of other foundations and nonprofits in Bolivia, Andres was able to undergo a relatively simple cardiac catheterization procedure at Santa Cruz’s Incor Hospital on April 19, 2017. The procedure went smoothly, and he was sent home the next day. Andres is back in school, and his family is optimistic for his future. 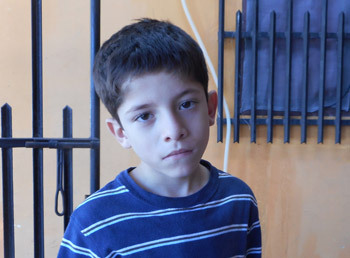 Fiorella shared the following testimony with the Solidarity Bridge / Puente de Solidaridad social worker: I get very afraid something will happen to my son; he always gets very weak after a surgery. I’m both happy and anxious for my son’s surgery, since it will be less invasive. I’m very grateful for the union of all the institutions that look out for the wellbeing of children!